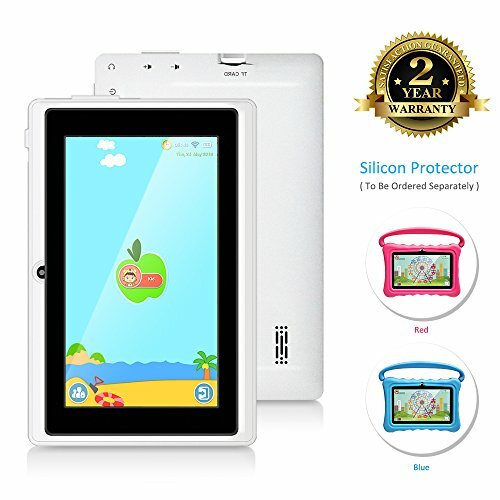 TOPELOTEK KIDS807 - Topelotek 7 inch kids tablet pc with wifi specification TOPELOTEK learning tablet for kids is devoted to kids' education. 1024 x600 ips display sharp and clear screen for protecting user's eyesight. You can download what you want from Google Store in our kids tablet. Flexible parental control: with parental control, kids can have their own personal playground, get access to enjoy playing games, so there is no need to worry about being harmful to the physical and mental health of your kids anymore. Support photo format jpg, giF, JPEG, BMP, etc. Support e-book format txt, htm, pdf, LRC, Html, EPUB, etc. Support Multi-languages. Kids tablet interface dc 5v 1* volume key 1* power button 1* micro usb port 1* tf card slot 1* Speaker 1* Headphone Connector 1* MIC Kids Tablet Power Supply Power Charger 5V/ 2A Battery 3. 7 Inch Kids Tablet PC Android Quad Core 1024×600 IPS Eye Protection Display 1+8GB Storage Learning Tablet with WiFi Bluetooth Dual Camera Parental Control - 8v/2800mah kids tablet package included 1* 7 inch kids tablet + tons of kids educational applications 1* charging Adapter 1* USB Cable 1* DC Cable 1* User's Manual Multifunctional kids tablet: 7 inch kids tablet pc android quad core with wifi, which stores photos, bluetooth, apps, music, 1GB RAM+8GB ROM. Support dual camera for taking photos and video chatting. Interesting but educational system: give your kids access to amounts of popular apps, books, videos, games, and educational content from pre-installed system. The innovative ability is one of our important goals of quality education. We really look forward to growing together, making progresses together with millions of kids! Brand: TOPELOTEK Model: KIDS087 OS Android: 6. Veidoo - Seamless fit design】the wrapping design of the product closely fits the tablet PC, beautiful and stylish, and brings intimate protection to your tablet PC. Silicone material】this case made by environment-friendly silicone material can be used safely for children. Front corner thicken design】integral shape, corner thickening process, 360-degree shock-proof and full protection of the tablet. High-quality body design】The interface design is easy to use and it is easy to operate the buttons without removing it. Adjustable bracket】 the adjustable bracket makes the tablet more stable. Adjust the right angle to free your hands and watch the video more convenient. Compatible with specific 7 Inch Tablet Q88, Not for All 7 inch devices. Kids Tablet PC Case, Shock Resistant Drop Proof Case Silicone Cover with Handle and Kickstand for Veidoo 7 inch Kids Tablet PC Q88 Blue - Product name:7 inch silicone case for kids tablet PC Q88Color: Blue, PinkSize: 8. 3*6. 3*08inchesmaterial: environment-friendly silicone materialPrecautions: Suitable Tablet Device Dimensions: 7. 16"l x 4. 76"w x 027"h 18. Western Digital Technologies Inc. SDSQUAR-032G-GN6MA - Seamless fit design】the wrapping design of the product closely fits the tablet PC, beautiful and stylish, and brings intimate protection to your tablet PC. Silicone material】this case made by environment-friendly silicone material can be used safely for children. Front corner thicken design】integral shape, corner thickening process, 360-degree shock-proof and full protection of the tablet. High-quality body design】The interface design is easy to use and it is easy to operate the buttons without removing it. Adjustable bracket】 the adjustable bracket makes the tablet more stable. For 16gb-32gb: up to 98mb/s read speed; write speed lower. 6 based on 4. 1gb transfer of photos avg. For 64gb-256gb: up to 100mb/s read speed; write speed lower. SanDisk Ultra 32GB microSDHC UHS-I card with Adapter - 98MB/s U1 A1 - SDSQUAR-032G-GN6MA - Adjust the right angle to free your hands and watch the video more convenient. Ideal for Android-based smartphones and tablets. 2 card only | 3 results may vary based on host device, app type and other factors. Transfer read speeds of up to 98mb/s Based on internal testing; performance may be lower depending on host device, interface, usage conditions and other factors. Rated a1 for faster app performance Results may vary based on host device, app type and other factors. Veidoo - Transfer read speeds of up to 98mb/s Based on internal testing; performance may be lower depending on host device, interface, usage conditions and other factors. Rated a1 for faster app performance Results may vary based on host device, app type and other factors. Uhs speed class u1 and speed class 10 for full hd video recording and playback Full HD 1920x1080 video support may vary based upon host device, file attributes, and other factors. Shockproof, waterproof, temperature-proof, and X-ray-proof Card only.10-year limited manufacturer warranty. Adjust the right angle to free your hands and watch the video more convenient. Ideal for Android-based smartphones and tablets. Compatible with specific 7 Inch Tablet Q88, Not for All 7 inch devices. Adjust the right angle to free your hands and watch the video more convenient. 7 inch Kids Tablet PC Case, Silicone Cover with Handle and Kickstand Compatible with TOPELOTEK 7, HENGKE 7, Dragon Touch Y88X Plus, Tagital 7 T7K, Contixo Kids Tablet K2 K3 Q88 Pink - Seamless fit design】the wrapping design of the product closely fits the tablet PC, beautiful and stylish, and brings intimate protection to your tablet PC. Seamless fit design】the wrapping design of the product closely fits the tablet PC, beautiful and stylish, and brings intimate protection to your tablet PC. Silicone material】this case made by environment-friendly silicone material can be used safely for children. Front corner thicken design】integral shape, corner thickening process, 360-degree shock-proof and full protection of the tablet. UJoyFeel - Nice choose!! Non-slip handle grip: this kids cases is designed for comfortable one hand grip and hands-free horizontal viewing angle or typing position for easy carry and travel, ideal gift for boys, girlskids tablet case with handle suitable for small children's hands. Transfer read speeds of up to 98mb/s Based on internal testing; performance may be lower depending on host device, interface, usage conditions and other factors. Tablet Case for Kids 7 Inch Kids Tablet Cases for Shock Proof Protective with Portable Convertible Handle Light Weight Rose red - 10-year limited manufacturer warranty. Easy installation: tablet case 7 inch cutouts for clear access to all buttons, speakers and rear-camera, ports, so easy for kids to install. Exclusively design: this cut designed kids cases is to form fit the UJoyFeel 7 inch kids tablet. That give parents peace of mind and kids freedom to leaning and growing in pleasure Kids Tablet Case Protective: The handle kid-proof case is designed to be the perfect solution for parents who need worry-free protection against drops, bumps, and the typical mayhem caused by kids at play. Adjust the right angle to free your hands and watch the video more convenient. Ideal for Android-based smartphones and tablets. evelove - Silicone material】this case made by environment-friendly silicone material can be used safely for children. Front corner thicken design】integral shape, corner thickening process, 360-degree shock-proof and full protection of the tablet. High-quality body design】The interface design is easy to use and it is easy to operate the buttons without removing it. Adjustable bracket】 the adjustable bracket makes the tablet more stable. Any others who may offer a lower price are not the official sellers. Easy installation: tablet case 7 inch cutouts for clear access to all buttons, speakers and rear-camera, ports, so easy for kids to install. Exclusively design: this cut designed kids cases is to form fit the UJoyFeel 7 inch kids tablet.
. Nice choose!! Non-slip handle grip: this kids cases is designed for comfortable one hand grip and hands-free horizontal viewing angle or typing position for easy carry and travel, ideal gift for boys, girlskids tablet case with handle suitable for small children's hands. Adjust the right angle to free your hands and watch the video more convenient. Evelove Women Winter Warm Beanie Headband Skiing Knitted Cap Ear Warmer Headbands - Seamless fit design】the wrapping design of the product closely fits the tablet PC, beautiful and stylish, and brings intimate protection to your tablet PC. Kids safe material: 7 inch tablet case for kids made from a lightweight, durable, impact-resistant EVA Rubber material, kid-safe, soft, provides protection against bumps drops and water. If you encounter such a seller in our store, please send his seller name directly to Amazon, because they are selling counterfeit products. MEZETIHE - Feel free to contact us whenever a question pops up in your head, we are always here to help. For more size information, please check with size picture in our listing page. Unique heart design with bling stone decoration for most women ladies and girls. Transfer read speeds of up to 98mb/s Based on internal testing; performance may be lower depending on host device, interface, usage conditions and other factors. MEZETIHE Oval Heart Cut Design Wedding Engagement Ring Size 6 7 8 9 10 Women Ladies Rings Jewelry Gift - 10-year limited manufacturer warranty. Two year's warranty: on-time customer service/tech support, guarantees customer satisfactory. You may suffer losses form them. If you encounter such a seller in our store, please send his seller name directly to Amazon, because they are selling counterfeit products. Material: Acrylic Pattern: Geometric. It will fit all most occasions like wedding, club, party, night evening and other special occasions. - It will fit all most occasions like wedding, party, club, night evening and other special occasions. Great choice to send it as a gift for your mother, teacher, daughter, friend, lover and etc. Package including: 1 x Ring. Though the price they offer are very low, they actually do not ship out the items. Silicone material】this case made by environment-friendly silicone material can be used safely for children. Front corner thicken design】integral shape, corner thickening process, 360-degree shock-proof and full protection of the tablet. High-quality body design】The interface design is easy to use and it is easy to operate the buttons without removing it. Adjustable bracket】 the adjustable bracket makes the tablet more stable. Women Fashion Casual Stripe Knitted Headband Hair Band Hair Accessories - Two year's warranty: on-time customer service/tech support, guarantees customer satisfactory. Special design can make the ear become more warm. Beanie headband can make you feel more comfortbale and fashion in the winter. Style: Casual. Unique heart design with bling stone decoration for most women ladies and girls. Adjust the right angle to free your hands and watch the video more convenient. Seamless fit design】the wrapping design of the product closely fits the tablet PC, beautiful and stylish, and brings intimate protection to your tablet PC. tolitec WL-18 - For more size information, please check with size picture in our listing page. Any others who may offer a lower price are not the official sellers. Adjust the right angle to free your hands and watch the video more convenient. Seamless fit design】the wrapping design of the product closely fits the tablet PC, beautiful and stylish, and brings intimate protection to your tablet PC. Kids safe material: 7 inch tablet case for kids made from a lightweight, durable, kid-safe, soft, impact-resistant EVA Rubber material, provides protection against bumps drops and water. You may suffer losses form them. Occasion: casual, Street, Outdoor, etc. Features women casual geometric pattern beanie headband. TOLITEC Main Charger 4.8A/30w 2-Port USB Wall Chargers with Auto-ID and Fast Charging 3.0 for Apple, Samsung, Nokia, Xiamoi and More Devices - Feel free to contact us whenever a question pops up in your head, we are always here to help. Evelove" is the only one official seller of "evelove"store. Easy installation: tablet case 7 inch cutouts for clear access to all buttons, ports, speakers and rear-camera, so easy for kids to install. Exclusively design: this cut designed kids cases is to form fit the UJoyFeel 7 inch kids tablet. Adjust the right angle to free your hands and watch the video more convenient. Ideal for Android-based smartphones and tablets. If you encounter such a seller in our store, please send his seller name directly to Amazon, because they are selling counterfeit products. J.Rosée JR-465 - If you encounter such a seller in our store, please send his seller name directly to Amazon, because they are selling counterfeit products. Material: Acrylic Pattern: Geometric. Notice: - the product on the illustration may look bigger than the reality. Amazing customer service - please feel free to contact us for any inquiry ☑ Gift advisor - There are so many moments to celebrate in life, the moment of birth, the moment we meet, the moment we start our dreams. J. Rosée jewelries would be your best choice. You may suffer losses form them. Easy installation: tablet case 7 inch cutouts for clear access to all buttons, ports, speakers and rear-camera, so easy for kids to install. Exclusively design: this cut designed kids cases is to form fit the UJoyFeel 7 inch kids tablet. J.Rosée Jewelry Mother's Day Gifts Packing 925 Sterling Silver Freshwater Cultured Pearl Linear Swirl Pendant Necklaces with 18" Silver Box Chain - Beanie headband can make you feel more comfortbale and fashion in the winter. Style: Casual. For more size information, please check with size picture in our listing page. The origin of J. Rosée - short for jewelry Rosée, Rosée in French stands for Dew. Best to wear perfume before wearing jewelry. TOP TEK Electronics KIDS07 - Feel free to contact us whenever a question pops up in your head, we are always here to help. It will fit all most occasions like wedding, club, party, night evening and other special occasions. Great choice to send it as a gift for your mother, teacher, daughter, friend, lover and etc. Package including: 1 x Ring. Adjust the right angle to free your hands and watch the video more convenient. Ideal for Android-based smartphones and tablets. Besides, apps and learning materials. Perfect gift for children: our kids tablets is equipped with advanced kids educational software, amounts of pre-installed free kids apps including Youtube, Netflix, books, movies and art learning, Google play puzzle games, Facebook, music, and many more apps you can download from Google Store. Kids Tablet Android 7 inch Kids Tablet Quad Core Kids Edition Tablet with WiFi Bluetooth Dual Camera, HD Kids Tablet Parental Control 1GB/16GB Storage - Design concept ★ the design of this one is unique - the unique pearl is so noble in the middle, and surrounded by infinite love. You are like the pearl to occupy all my heart. Luxurious material ★ made of fine 925 sterling silver, AAA Cubic Zirconia, Freshwater Cultured Pearl. Special design can make the ear become more warm. Easy installation: tablet case 7 inch cutouts for clear access to all buttons, speakers and rear-camera, ports, so easy for kids to install. Exclusively design: this cut designed kids cases is to form fit the UJoyFeel 7 inch kids tablet. Passed the Certificate of Precious Metal.